In scrap metal…not the ideal location for a priceless piece of art. Luckily, the Romonov treasure was identified before being melted down as scrap metal. The buyer purchased the golden egg timepiece at an antique sale in the United States. In fact, it was the watch encased in the golden shell that tipped the buyer to its possible importance. The watchmaker’s name, Vacheron Constantin, was etched on the back of the clock. The man searched the internet for the name and an image in an earlier Telegraph article contained a picture matching the egg he had in his possession. The man contacted the Fabergé aficionado named in the article who flew to American Mid-West and verified the eggs authenticity. Now in the hands of a private collector, experts appraised the Fabergé at $33 million. 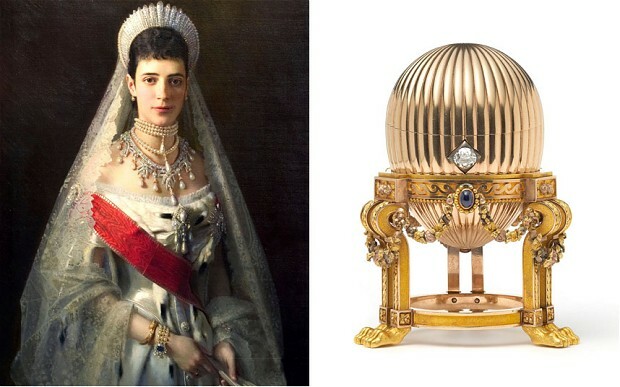 According to the Telepgraph article, the Fabergé egg find is one of the 50 commissioned by Tsar Alexander III. This particular egg was a gift from Tsar to the Tsarina as an Easter gift. The egg is on public display for brief time at the Wartski headquarters in Mayfair (Wartski antique dealers brokered the final sale of the egg).